This post is an excerpt from the free downloadable ebook, CPVC Use in Power Generation Plants. To access the full ebook, click here. Power generation plants of all types—from gas turbine combined cycle to nuclear to combined heat and power—all require the movement of large amounts of water and handle caustics and corrosives. Unfortunately, due to the nature of the chemicals used and levels of heat and pressure involved, there are few pipe, valve, fitting, ducting and tank liner material choices available that can provide long-term reliability. That said, judiciously assessing these material options on a system-by-system basis can directly increase operational efficiency, minimize downtime and improve bottom-line performance. Power generation plants rely on systems that are both efficient and reliable. Efficiency comes from the optimal usage of energy, while reliability is a result of minimal breaks and corresponding downtime. An important cog in a power generation plant is the cooling water treatment system, which removes unwanted heat within a plant. In the United States, for example, thermoelectric power plants—including coal, nuclear, natural gas and oil—make up about 90% of all power generation plants. Though processes within each type of thermoelectric plant differ, each requires cooling. When the power generation plant’s cooling system cannot efficiently remove heat, especially in warmer climates, the entire plant suffers costs of excess water, wastewater and energy. 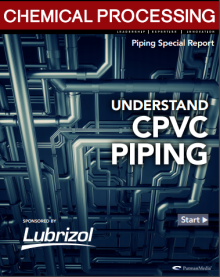 For cooling systems—which include water loops, towers and headers—our product and engineering team list the primary issues plant managers face, and how schedule 80 CPVC piping can help prevent these problems. In power generation boiler systems, water purity is critical, as the slightest contaminant can lead to deposits, corrosion and scaling on the turbine blades or tubing, reducing efficiency and limiting the life of the system. Boiler water comes from natural bodies, which contain many impurities, including dissolved gases (i.e. oxygen and carbon dioxide) and minerals (e.g. calcium and magnesium) that must be removed from the fluid. To remove the mineral impurities, the feed water goes through a demineralization process, which removes ions that can be detrimental to the system. In this post, our product and engineering team breaks down how demineralization is achieved through ion exchange, and offers advice on the vessel, container and piping materials best suited for this process. Effective feed water processing is an essential part of any boiler system, especially when the boiler is used in power generation. Feed water processing requires corrosive solutions that can eat away at and weaken metal materials. In addition, other chemicals are used that can cause scaling within the system, choking off the flow of water and increasing pressure. In the case of power generation, another major and unique concern is the efficacy and lifetime of the turbine blades. During power generation, the boiler creates the steam that turns the generator turbine, but if this steam contains impurities or hardness from boiler feed water, it can cause corrosion and scale on the blades. To ensure the efficiency and long-term performance of your power generation system, our product and engineering team developed this post to walk through how boiler feed water treatment systems typically work, and call out the areas that can be problematic to metal piping systems. The Electric Power Conference and Exhibition is one of the largest conferences for the power generation industry. The event brings together power generation professionals from around the world to meet, network and address critical issues facing the industry. If you’re attending, stop by our Lubrizol Advanced Materials booth #104. Our team of regional CPVC product and engineering specialists will be on hand to provide advice, information, and training on power generation pipe and fitting systems. Specifically, we can explain how advanced CPVC technology can increase operational efficiency, minimize downtime and improve bottom line performance. Event Details: Where: McCormick Place West, Hall F1 in Chicago, Illinois Dates: Conference: April 10-13 (Exhibition: April 10-12) More Details: Visit 2017.electricpowerexpo.com.